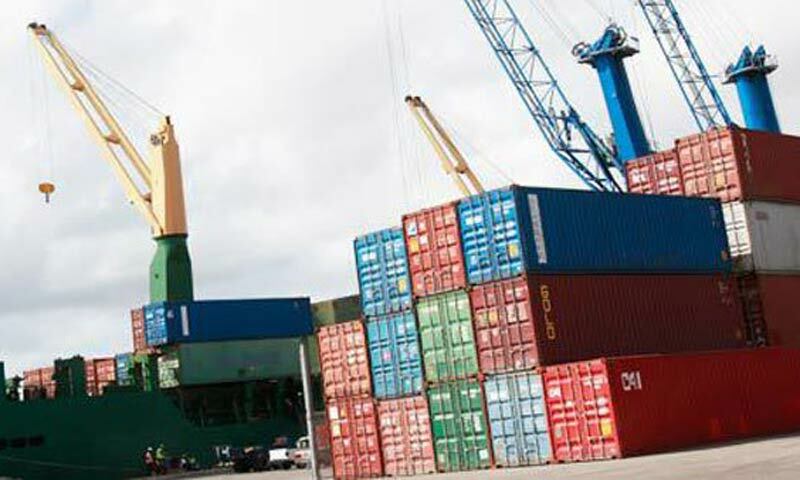 KARACHI: City ports have started facing congestion as goods-carriers strike entered the consecutive eighth day on Thursday, amid warning by goods transporters that they would stop haulage of daily consumer goods soon after Ashura, if their issues were not resolved. A large number of vessels are currently waiting at the off-port and a large number of containers and a huge quantity of loose cargo is stranded inside the ports. Before the strike call was given by the goods-carriers last Thursday, there was zero-waiting period for vessels at the Karachi and Qasim ports. However, as cargo movement came to a standstill, a large number of containers and a huge quantity of loose cargo have accumulated inside port areas, official sources told Dawn. Sources disclosed that the two container terminals at Karachi Port � Pakistan International Container Terminal and Karachi International Container Terminal with a backup area to stack around 35,000 containers � have almost reached their saturation point. Similarly, around 12 container vessels, three loaded with coal and two to load cement, are currently waiting at the off-port at Karachi. However, most damaging is that around 7,000 containers loaded with export cargo could not meet their shipping schedules. Furthermore, several other vessels after waiting at the off-port diverted to Dubai and other regional ports after they were refused berths at the two ports of the country owing to congestion. According to details, currently around 15 ships are berthed at Karachi port unloading DAP fertiliser, general cargo, seeds, sulphur, container and one vessel loading cement. The United Goods Transporters Alliance (UGTA) secretary general Mohammad Shoaib Khan talking to Dawn complained that during the last nine days, no serious effort was made by the government to resolve the issue. He further said that several meetings were held with Sindh government officials, including the one with Governor Dr Ishratul Ibad and the Commissioner of Karachi, but without any result. Even business community tried to play their role in resolving the issue and a delegation of Karachi Chamber of Commerce and Industry (KCCI) and chief of Karachi Tajir Ittehad held meeting with UGTA leaders. Mohammad Shoaib Khan said that if the government does not show seriousness in resolving the problem of transporters at the earliest, the situation may go out of their control and the entire responsibility would rest with the government. He expressed his dismay over government apathy on such a sensitive issue which paralysed economy of the country. Transporters say that they were facing issues and many are related with the provincial government, including those of police and others are related with the federal government, such as customs, NHA and KPT. Citing an example, he said that transporters job is only to carry goods from one place to the other, but police and National Highway Authorities keep on asking our members to provide such documents in the middle of journey which are related to importers, clearing agent or the owner of the goods. The police impose heavy penalties and even harass and detain our truckers without any reason, he complained. Responding to a question, he said, hundreds of loaded vehicles are presently parked on almost all approach roads of Port Qasim and if the government continues to delay, the situation may go out of control. The goods carriers have warned that if the government does not come forward and show seriousness in resolving their issues, soon after the Ashura they will expand their strike by stopping the haulage of daily consumers good. Talking to Dawn, press secretary of United Goods Transporters Alliance (UGRA), Fazal Mannan Jadoon, said that after Ashura their members would stop haulage of fresh fruits and vegetables and other consumers goods. All-Pakistan Textile Mills Association (Aptma) chairman Yasin Siddik said that during last eight days the country suffered around $350 million loss in exports alone. He further said that most of the export consignments stuck up belong to export orders related to Christmas and New Year. Besides, he said, billions of rupees loss had been suffered by other sectors of the economy due to non-availability of raw material to industries, resulting in stoppage of manufacturing process, etc.